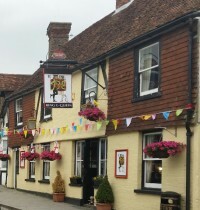 The King and Queen sits on the High Street of the town of Edenbridge and close to the River Eden. A half peg-tiled cottagey pub with a cosy, beamed interior, this pub represents a traditional local. Thought to date from the 16th century, The Pub offers a friendly warm and comfortable welcome from the Owners and their staff, with oak beams and comfy leather sofas by the open fire.